The dive center «Scuba Birds» in Koh Tao and Koh Samui provides diving training services. Our experienced instructors and PADI divemasters will guide you underwater and arrange a meeting with the family of clownfish. Clownfish is not great at swimming, so it is difficult to imagine their life without the patronage of an anemone (anemone). So they all form symbiotic mutualisms with sea anemones. Clownfish relieve actinia from dead tentacles, keep it clean, attract the attention of small animals, which are paralyzed and eaten by actinia. In turn, clownfish get protection. Hardly Nemo will feel danger, as they immediately rush to hide in the poisonous tentacles of their living house. Interesting fact! Anemonefish are sequential hermaphrodites, meaning they develop into males first, and when they mature, they become females. If the female anemonefish is removed from the group, such as by death, a widowed male transforms into a female, capable of laying eggs. 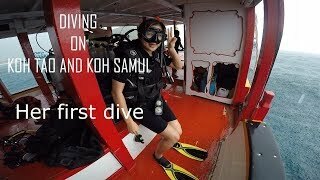 PADI Open Water Diver, PADI Advanced Open Water Diver, or PADI Discover Scuba Diver while diving in Koh Tao and Koh Samui.